Agilent/HP 3070 fixture personality pin PHP-70. Black plastic body with gold plated tail. Please choose your Head Diameter and/or Head style to select Probes. 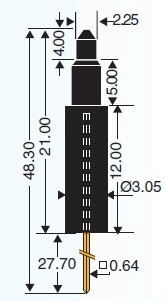 The suitable part numbers are then shown below our head style images.